It was all thanks to the invitation we got to be part of a panel at the Hay Festival 2017, that I got a chance to meet Mr. Neil Gaiman and happened to get my copy of The Ocean at the End of the Lane signed too. Wait, but I am getting ahead of myself. Stories like these need to be savoured. Stories like these cannot be completed in hasty sentences. 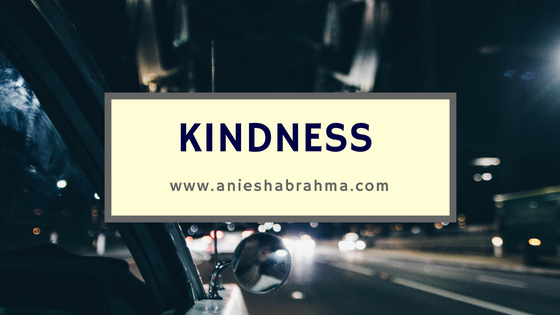 I am sure you want to know the how, the when, the what, the who...and the endless stream of questions that has definitely crossed your mind as soon as you saw the name of this post! So let me start by telling you how I came across this fantastic storyteller named Neil Gaiman. I was intrigued by this part. 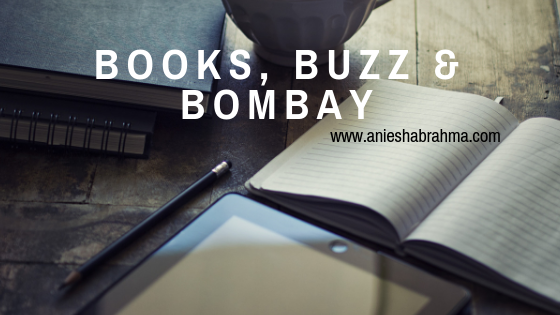 When I went to Bangalore last year in September, I visited Blossoms with my book blogger friends, Debdatta di, Sachin, Sudeshna and Led da. Sachin took me to the section that was dedicated to Neil Gaiman, and it was there that I bought three of Neil Gaiman's books: Coraline, The Ocean at the End of the Lane, and The Graveyard Book . I finished reading Coraline during my flight back home, and I finished The Graveyard Book around Christmas, and finally I started reading The Ocean at the End of the Lane, as the trip to Wales drew nearer. I just knew I would have to carry one of his books with me. This one won the lottery, being the one that I was yet to finish reading. Flying off to Wales wasn't as easy or romantic as it sounds. For one thing, trying to apply for UK visa is as good as good as playing twenty questions with someone who has a vested interest to know all of your history - history you might not even be aware of! And making sure the document checklist is met with. The visits to the banks to ask for your statements, asking the accounts department for your pay slips, and finally, asking your landlord for the bills that you've been paying for quite some time now! 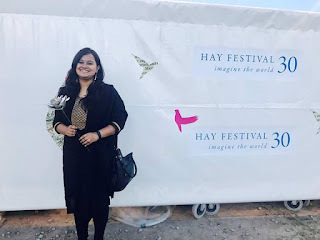 It was during the time when I was stalking myself on Google, trying to find something I had probably missed, that I came across a PDF file which had listed all the authors appearing at Hay. Surprise, surprise! There was my name and there was Neil Gaiman. I have no idea how I didn't scream my lungs out, out of sheer happiness and excitement that afternoon. But from that very minute, I was dead sure that I would get to see him! Not even for a second did I doubt it. Although Mr. Neil Gaiman was around the site that first day, we didn't get meet him. The next day, my friend Esha saw a post which said he was around. So we went to the author's lounge and we waited, bidding our time. 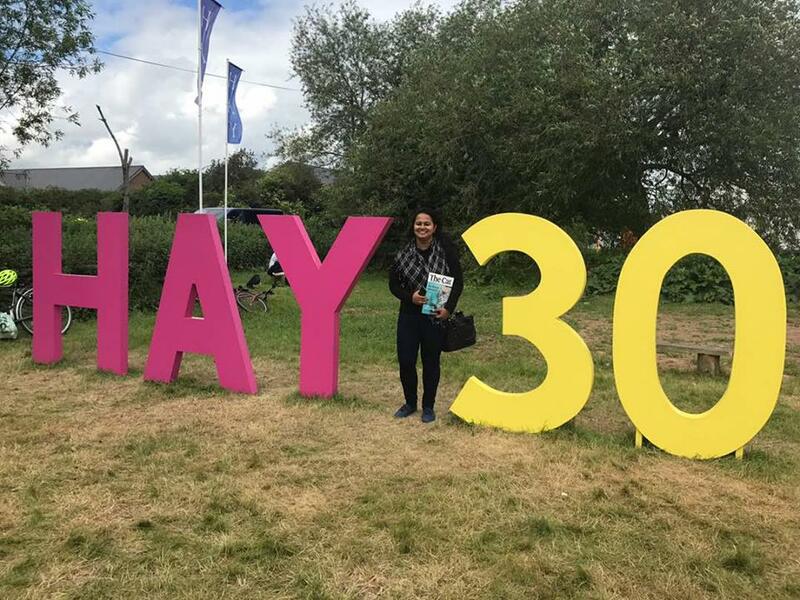 After ten minutes, she asked if one of us ought to go and see if the Neil Gaiman and Stephen Fry session Myth Makers had any tickets left? (Because we'd been trying our luck ever since we'd arrived, and so far, nothing. Every time we were greeted with, Sorry. I am afraid that's sold out.) But you know those feelings you get when something inside of you tells you not to move from where you are, I had that. So I didn't answer her. Five minutes later, as I turned to speak to her, Esha said, "Aniesha, Neil Gaiman just passed by." Almost in reflex, I stood up and said, "Come on, let's go talk to him?" However, my friend was utterly starstruck and frozen in her place and could only say, "I think he's busy." So I peeked and saw that he was ordering a cup of tea from the refreshment center. I asked Esha again to come with me and speak to him. I didn't know if he would be around long enough, so I left her sitting there and walked up to him. Imagine me! The girl who had been terrified of her own voice, the girl who loved hiding in the shadows and ask people to leave her alone when things got too much for her, walking up to one of her most favourite authors just for a quick chat! Me: Hello, I am Aniesha. 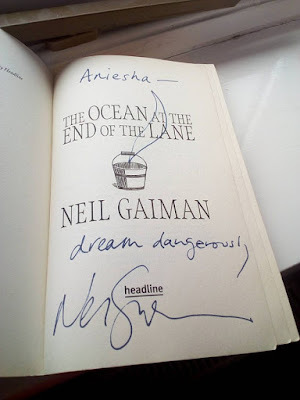 Neil Gaiman (shaking my hands): Hello, Aniesha. I am Neil. Me: *dies internally but blurts out* I traveled 8,183 km just to meet you! I am from Calcutta, India. Neil Gaiman: Oh, really? That's wonderful. We chatted for a while, asked if he would kindly let us take pictures with him and sign our copies. I love how he personalized each of our books. It's nice that no two people ever get the same message from him. Esha got her copy of American Gods signed, and no, he didn't ask her if she was watching the TV series based off his novel. Then bursting with happiness we came back to the house where we would be staying, unable to believe our luck, and trying to make ensure we weren't just dreaming! We went back to the Festival site, got a ticket for the show from the lucky draw (which Esha gave to me), and because the women manning the counter saw how desperate we looked, they had a look into their ticket system and said the show wasn't sold out. We needed to try our luck one last time at the counter. Well, there was exactly one last ticket, and we bought it. 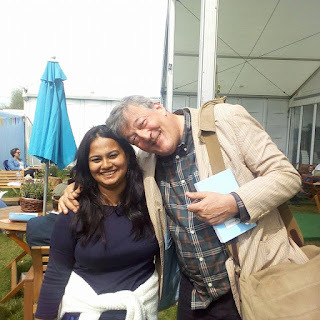 Then we attended the session where Neil Gaiman and Stephen Fry were in conversation about the myths and legends. It was interesting but honestly, I was expecting a lot more from it! But oh well, I don't know when I'd get to experience such a session again, so I have no regrets. 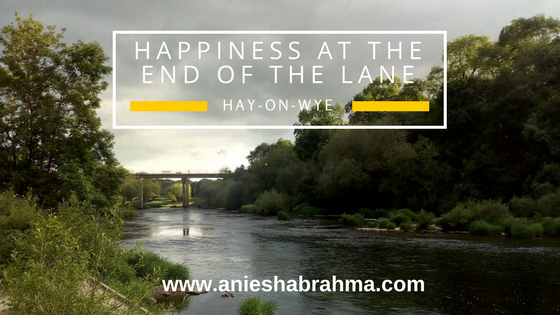 I have a lot of memories from my trip to Wales that I would hold close to my heart forever. 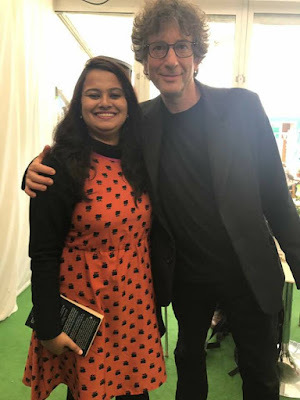 However, this one, the entire day that was filled with magic and Neil Gaiman is what jumps out at me, every time someone asks me what was the one thing that has been truly memorable. Without a doubt, it was meeting Neil Gaiman.